Boff, Bonk, Pow, Plop, Kapow, swa-a-p, whamm, zzzzzwap, bam… Are these the sounds of your kitchen exploding or a typical 1960s Batman fight scene? Remember the visual sound effects on the 1960s TV version of Batman starring Adam West? Everytime someone got punched, kicked or hit during a fight scene, a giant Pow or Bonk graphic was sure to follow. Many people found these graphics a little corny, but fans of the 1960s Batman TV show might want to check out the Batmania website. They have made it their mission to collect and catalog screenshots of every fight scene graphic and how many times it was used during the run of the show (1966-1968). These fight scene graphics served a dual purpose. 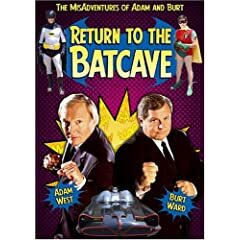 They helped tie Batman back to its comic book origins while covering up the terribly choreographed fight scenes (most punches never landed on the body of the intended victims). TRIVIA NOTE: Initially, the title shots like POW! were placed over a scene so you could see both the actors and graphic. But because it cost too much money to create these title pages (combination of camera work and artwork), it was decided that just the POW!, for example, would fill the screen, thus saving on the budget.